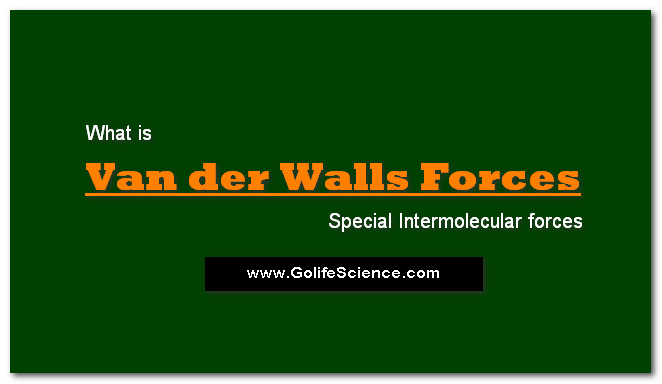 Van der Waals forces’ is a general term used to define the attraction of intermolecular forces between molecules. There are two kinds of Van der Waals forces: weak London Dispersion Forces and stronger dipole-dipole forces. The chance that an electron of an atom is in a certain area in the electron cloud at a specific time is called the “electron charge density“. 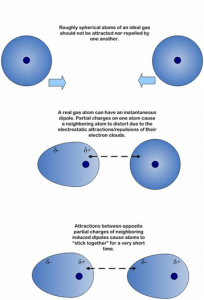 Since there is no way of knowing exactly where the electron is located and since they do not all stay in the same area 100 percent of the time, if the electrons all go to the same area at once, a dipole is formed momentarily. Even if a molecule is nonpolar, this displacement of electrons causes a nonpolar molecule to become polar for a moment. Van der Waals forces, relatively weak electric forces that attract neutral molecules to one another in gases, in liquefied and solidified gases, and in almost all organic liquids and solids. The forces are named after the Dutch physicist Johannes van der Waals, who in 1873 first postulated these intermolecular forces in developing a theory to account for the properties of real gases. Solids that are held together by van der Waals forces characteristically have lower melting points and are softer than those held together by the stronger ionic, covalent, and metallic bonds. Since the molecule is polar, this means that all the electrons are concentrated at one end and the molecule is partially negatively charged on that end. This negative end makes the surrounding molecules have an instantaneous dipole also, attracting the surrounding molecules’ positive ends. This process is known as the London Dispersion Force of attraction. The ability of a molecule to become polar and displace its electrons is known as the molecule’s “polarizability.” The more electrons a molecule contains, the higher its ability to become polar. Polarizability of Van der Waals Forces increases in the periodic table from the top of a group to the bottom and from right to left within periods. This is because the higher the molecular mass, the more electrons an atom has. With more electrons, the outer electrons are easily displaced because the inner electrons shield the nucleus’ positive charge from the outer electrons which would normally keep them close to the nucleus. When the molecules become polar, the melting and boiling points are raised because it takes more heat and energy to break these bonds. Therefore, the greater the mass, the more electrons present, and the more electrons present, the higher the melting and boiling points of these substances. These forces are similar to London Dispersion forces, but they occur in molecules that are permanently polar versus momentarily polar. In this type of intermolecular interaction, a polar molecule such as water or H2O attracts the positive end of another polar molecule with the negative end of its dipole. The attraction between these two molecules is the dipole-dipole force. The V in the formula refers to the volume of gas, in moles n. The intermolecular forces of attraction are incorporated into the equation with the n2aV2 term where a is a specific value of a particular gas. P represents the pressure measured, which is expected to be lower than in usual cases. The variable b expresses the eliminated volume per mole, which accounts for the volume of gas molecules and is also a value of a particular gas. R is a known constant, 0.08206 L atm mol-1 K-1, and T stands for temperature. Unlike most equations used for the calculation of real, or ideal, gases, van der Waals equation takes into account and corrects for, the volume of participating molecules and the intermolecular forces of attraction. 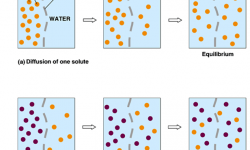 Van der Waals forces may arise from three sources. First, the molecules of some materials, although electrically neutral, may be permanent electric dipoles. Because of fixed distortion in the distribution of electric charge in the very structure of some molecules, one side of a molecule is always somewhat positive and the opposite side somewhat negative. The tendency of such permanent dipoles to align with each other results in a net attractive force. Second, the presence of molecules that are permanent dipoles temporarily distorts the electron charge in other nearby polar or nonpolar molecules, thereby inducing further polarization. An additional attractive force results from the interaction of a permanent dipole with a neighboring induced dipole. Third, even though no molecules of material are permanent dipoles (e.g., in the noble gas argon or the organic liquid benzene), a force of attraction exists between the molecules, accounting for condensing to the liquid state at sufficiently low temperatures. The nature of the attractive force in molecules, which requires quantum mechanics for its correct description, was first recognized (1930) by the Polish-born physicist Fritz London, who traced it to electron motion within molecules. London pointed out that at any instant the center of negative charge of the electrons and the center of positive charge of the atomic nuclei would not be likely to coincide. Thus, the fluctuation of electrons makes molecules time-varying dipoles, even though the average of this instantaneous polarization over a brief time interval may be zero. Such time-varying dipoles, or instantaneous dipoles, cannot orient themselves into alignment to account for the actual force of attraction, but they do induce properly aligned polarization in adjacent molecules, resulting in attractive forces. These specific interactions, or forces, arising from electron fluctuations in molecules (known as London forces, or dispersion forces) are present even between permanently polar molecules and produce, generally, the largest of the three contributions to intermolecular forces.